KMT Waterjet Systems. Baxter Springs, KS, will introduce the Streamline Pro 100,000-PSI, 7000-bar waterjet pump. 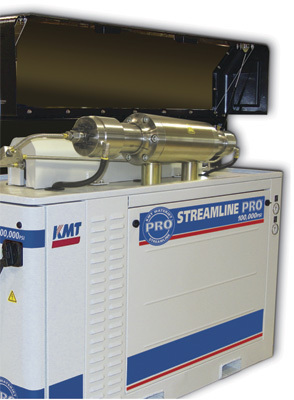 In addition to increasing linear cutting speed by more than 100 percent in some applications, the second-generation KMT Streamline Pro Series of ultra-high-pressure pumps cuts nonlinear aluminum, steel, titanium and stainless steel as much as 75 percent faster than standard waterjet systems cutting at 60,000 PSI, say company officials. KMT also will introduce its new economy-line waterjet pump, the NeoLine Series, an entry-level option for low-volume job shops, sign shops, and automotive-parts and prototype fabrication.